Keeping warm and dry on the ice is essential. While an awesome shelter and heater can help, if you’re constantly fiddling with your tip-ups, fishing in the open, or taking a long snow-machine ride to the ice, you’ll need the best bibs you can find. Even just the repetitive kneeling that ice angling demands will put your outerwear to the test, and if you’ve ever suffered sore, wet knees, you probably already own a nice bib! –into service on the ice. Now don’t get us wrong, snow bibs and coveralls are awesome winter wear, but you’ll find them sorely lacking on the hard water. Clam Ice Armor Ascent – Our Pick! 2.1 Clam Ice Armor Ascent – Our Pick! 3 Our Pick – the Clam Ice Armor Ascent! Ice bibs may look a lot like foul weather gear or ski bibs, but they’re worlds apart in the details. 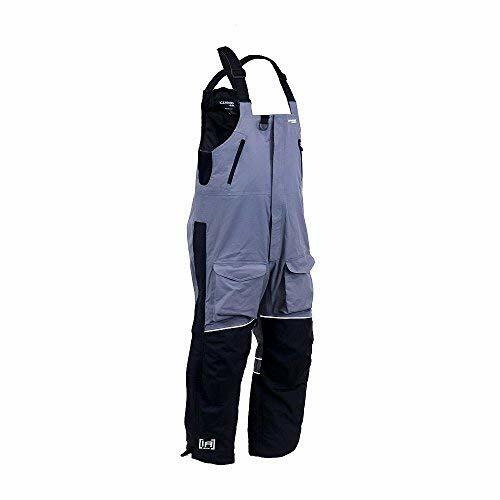 For instance, you’ll see Huk’s excellent all-weather bibs reviewed as ice fishing gear, but they’d be a very, very poor choice for a winter angler who’ll be kneeling next to a hole and braving freezing temps. 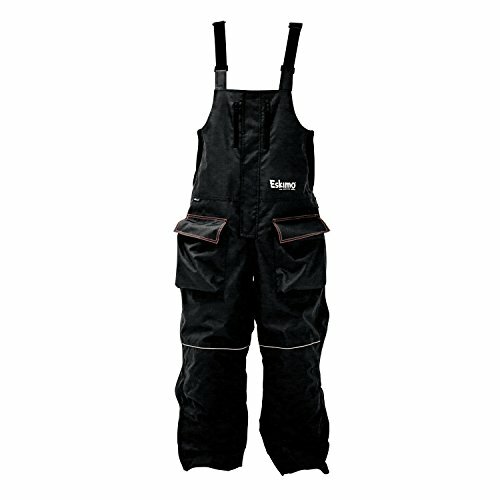 While simply awesome for cool, rainy days, Huk’s bibs aren’t designed for the weather you’ll face on the ice or the specific demands of a hard water angler. That’s just as true for snow bibs. While they’ll keep you plenty warm, they lack essentials like knee pads. That may not seem like a big deal until you realize just how much abuse ice fishing offers your knees or how much warmth the ice steals from that contact. Do yourself a favor and stick to clothing designed for the activity you’re doing. You’ll be a lot more comfortable and have a lot more fun. Knee pads are an essential component of a good ice fishing bib. From checking tip-ups to tying knots, skimming your holes to measuring fish, any experienced ice angler can tell you that your knees are going to take a beating. It’s important that you protect them from the hard ice, and critical that they remain well-insulated, too. This is where ski bibs will inevitably fail. Insulation works by trapping air, which in turn traps body heat. Compressing most insulation will greatly reduce its effectiveness. A perfectly warm ski bib can get chilly in a hurry when you sit or kneel on the ice in it. The best knee pads are thick and comfortable, preventing pain while also acting as a thermal barrier to stop the ice from stealing your body heat through direct contact. If there’s an eternal truth of fishing, it’s that you’re going to get wet. If you’ve spent much time in an ice shanty, you’ve been sprayed by struggling fish, watched as your heater turned the floor into a shallow puddle, and had the ice and snow on your bib threaten to drench your clothes. Good ice bibs are as waterproof as modern tech can make them. But if you break through the ice, you’re going to be drenched. 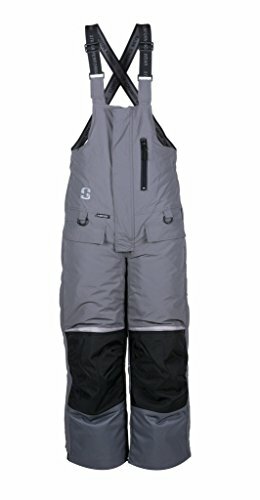 This is obvious, but you’ll still find foul weather gear recommended for ice fishing, far exceeding its capacity to keep you safe from the bitter cold. The products that made our short list are well-insulated and will protect you from the worst winter weather. Of course, you need to do your part and layer properly to get the most from your bibs. You want all your gear to last, but you’ll be punishing the fabric shell on your ice bibs even if you baby them. Hours of abrasion against the ice, punctures by hooks and knives, and even a brush with a heater is all in a day’s work for this outerwear. Toughness isn’t a secondary concern, and we like our bibs to feature heavy-weight material, lots of reinforcing, and strong zippers. Easy to overlook as a design feature to consider, pockets are an angler’s best friend. When you need to re-bait a tip-up, for instance, what’s better than reaching into a handy pocket for your knife, your soft bait, and your pliers? Some of the bibs we review offer built-in flotation aids in the event you break through the ice and end up in the water. When combined with an additional jacket, these two-piece suits can be life savers, helping you self-rescue. While not an essential feature in an ice bib, it’s something we like to see. We’ll note the bibs that feature this extra and provide a link for the jacket with which they’re paired. Female anglers, we haven’t forgotten about you! Due to differences in shape, many men’s bibs just won’t fit women well. Unfortunately, there aren’t a lot of options designed for women, but we’ll review one popular model and note the men’s bibs that other women have found acceptable. Clam is a well-respected name on the ice, and their portable shelters are top quality. It’s no surprise, then, that their outerwear is excellent, too, designed for ice anglers to get the most from their time on the hard water. Made from 300 denier waterproof fabric, and featuring padded 1000 denier knee reinforcement, their Ascent bibs are built to last. We’re really impressed by the knee padding. You can rely on it to keep you dry, warm, and ache-free all day. That’s essential in a good pair of bibs, and you won’t be disappointed by how your knees are pampered. They’re warm, too, with 150 grams of removable Thinsulate retaining your body heat. This is a great feature that will allow you to adjust the bibs’ warmth for different seasons. We really like the idea of being able to adapt to late fall and early spring, when the worse winter has to offer has yet to arrive or has already passed. These bibs offer three sets of pockets: a fleece-lined pair of hand warmers–always welcome–two small zippered chest pockets, and two large thigh pockets to hold small items like bobbers, a knife, or anything else you might need to keep with you. The Ascent also protects your smartphone with a waterproof pocket designed to keep it dry even in the event of a plunge in icy water. 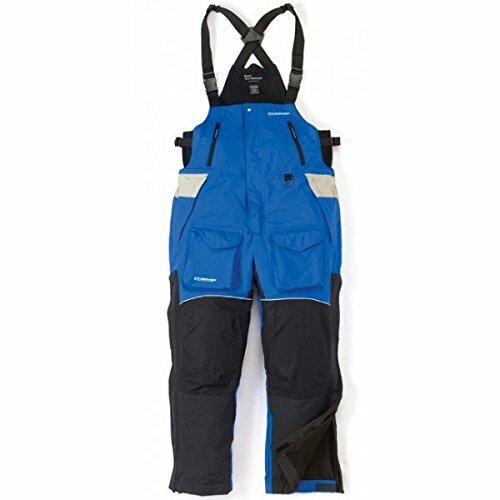 With a bi-directional front zip, sealed by a magnetic storm flap, quick release suspenders, and thigh-length zippers on the legs, getting into and out of these bibs is simple–even while wearing boots. Another feature we appreciate is the Ascent’s storm gaiters to prevent wind from ripping up the pant legs. Adjustable for inseam, they’ll help keep you warm in the worst winter wind. Essentially an upgraded version of their popular Edge bibs, they add a buoyant material that can help you self-rescue should you fall through the ice. While not Coast Guard approved, we like that feature, and for the more safety-minded, this is something to consider. Especially when paired with the equally awesome Ascent parka, that extra flotation can be a life saver. Made from the same 300 denier waterproof fabric as the Ascent, and featuring identical padded 1000 denier knee reinforcement, Clam’s Ice Armor Edge bibs are essentially the Ascent minus the floatation, removable liner, and smartphone pocket. Like Clam, you’ll recognize the Eskimo name, and they’re a well-respected, trusted company on the ice. While they only offer a single ice fishing bib, it’s pretty awesome, and we’re taken with its features and quality. Built to take abuse with a 600 denier Endura nylon shell, Eskimo’s Lockout bibs will really keep you warm in terrible conditions. A baby-soft interior lining and 60g of Thermadex insulation will lock out the cold, and these bibs are coated with Hydrapore 5000, a proprietary polyurethane laminate, so you can rest assured you’ll stay dry, too. Your knees will be coddled by great padding, and with thigh-length zippers covered by a storm flap, these bibs are easy to slip over boots. Two small vertical zippers on the chest can store small things like a phone or wallet, and two enormous thigh pockets are great for all the other gear you need to keep ready to hand. We’d really like to see hand warmer pockets, but they’re not an essential. Like Clam’s Ascent, Eskimo’s Lockout adds a layer of buoyant material to aid self-rescue in case you break through the ice. When combined with their equally excellent parka,, this can enhance your safety, which is a thoughtful feature we really like. Our criticism of these otherwise outstanding bibs are related to small details. Besides the absence of hand-warmer pockets, they don’t feature quick release suspenders. These aren’t crippling failures, but that does tip our recommendation in the direction of the Clam Ascent. Frabill is obviously no stranger to ice anglers, and you’d be hard-pressed to find a better ice bib than the I3. While Frabill has two “better” bibs, the I4 and I5, we think the I3 offers the best balance of features and price. Covered in a 300 denier nylon shell, the I3 is as waterproof as you can get. With sealed seams and a proprietary water-repellant coating, these bibs get highest honors in this department. At the knees and other wear areas, expect a dual layer of 500 denier material and plenty of padding. We haven’t noticed any durability difference between this system and 1000 denier rivals, and the padding is ample and warm. 150g of Thinsulate insulation and a soft tafeta interior keep you plenty warm, though as always, layering is essential. The I3 offers leg zippers that open to the thigh, making them very easy to put on over snow boots. Unfortunately, the suspenders don’t offer a quick release, though that’s far from a deal breaker. Two D-rings and two reinforced eyelets let you attach gear directly to your bib, offering plenty of options. Two large thigh pockets can stow essential gear, and they also offer two fleece-lined hand warmer pockets, always a nice touch. These bibs sport a bi-directional zipper backed by a waterproof flap. Some users report trouble using the urinal in these bibs, while others indicate no problems. While packed with features we love, these bibs are remarkably inexpensive, too. Striker’s Ice Climate bibs are among the warmest mid-range bibs we reviewed. If you regularly fish on the open ice, ride a snowmachine to the hard water, or need exceptional warmth, these are definitely worth a close look. Beneath a 320 denier waterproof shell coated in the same Hydrapore polyurethane coating as the Eskimo, you’ll find a full 150g of removable Thermadex insulation. In warmer weather, you’ll need to take that into account, either by reducing layers, venting carefully, or going without the liner. That said, in bitter weather, the Ice Climate bib lives up to its name. Well-padded at the knees and seat, you won’t feel the ice against your joints or lose precious heat to it. Excellent zippers are covered by a magnetically sealed storm flap, a really great feature when the weather is awful. And with thigh-high zippers on the legs, venting and slipping these on over boots is a snap. One small zippered pocket is available on the chest, complemented by two large thigh pocket that are covered by removable hand towels, a really awesome detail for anglers. Finally, two fleece-lined hand warmer pockets are available to rewarm your frozen fingers. Like the Eskimo Lockout, rumored to be made by Striker, this bib features a 150g Sureflote layer that adds buoyancy to assist self-rescue. When combined with the Ice Climate parka,, which is every bit as capable as the bib it pairs with, you can feel a tad safer should you end up in the water. Some women report that this bib fits well, though that probably depends on your particular shape. Striker’s Ice Prism are pretty much the only popular bibs designed specifically for female anglers. Often a neglected segment of the fishing population, we’re glad that Striker took the fit issues of women seriously. Unfortunately, we don’t think these bibs stack up as well against some of the competition, and if you can find a men’s bib that fits you well, we recommend going in that direction. There’s a lot to like about these bibs, though. Covered in a tough shell of 320 denier nylon, they feature the same Hydrapore water resistant coating as Striker’s other products. And like the exceptionally warm Ice Climate bibs, the women’s Ice Prism offers 150g of Thermadex insulation. Unlike the Ice Climate, however, this is not removable, and you’ll need to manage that warmth as the mercury rises. Ample knee padding is essential, and the Ice Prism delivers. 1680 denier material reinforces the knees, too, making this among the toughest bibs available. We appreciate that, and you can expect these to last. The zipper system is excellent on both legs and front, and it’s protected by a storm flap. The suspenders don’t feature a quick release, but they should be relatively easy to take on and off, even over large boots. Where we’re not as impressed is storage. Two internal thigh pockets and one small zippered chest pocket are it, meaning this bib doesn’t offer anywhere near the storage of comparable designs for men. That’s something we really don’t like, and we’re pretty sure female ice anglers will agree with us. You can also forget about hand warmer pockets–the Ice Prism doesn’t offer them. Still, buoyed by 150g of Sureflote, when paired with a matching parka, you’ll be better able to self-rescue in an emergency. You’ll know Vexilar from its line of popular flashers, but you may not have known that they make ice fishing outerwear, as well. Featuring the quality and details hard water anglers demand, these are a solid choice if you’re not looking for additional buoyancy or fancy insulation. Vexilar knows ice fishing, and that’s apparent in these bibs. A 300 denier waterproof shell covers warm fleece lining, and while not high-tech, that fleece works pretty well. Of course, the Cold Snap sports knee pads, though they’re not as thick as the competition. Plenty of anglers swear by these bibs, so we don’t doubt they protect your knees adequately. The zippers are excellent on these bibs, and they’re well-protected by storm flaps. Quick release suspenders and thigh-length zippers make this one of the easiest bibs to put on and take off over bulky boots. We appreciate that feature and think that you will, too. These bibs buckle at the waist, helping create a snug fit and keeping your body heat where it’s supposed to be. Fleece-lined pockets will keep your hands comfortable, and two large thigh pockets can stow the gear you need to access quickly. There’s also an easy-to-access pocket on the inside of the bib for things like a smartphone and keys. While not as warm as some of its higher-tech rivals, these bibs are a solid choice for budget-minded anglers. Our Pick – the Clam Ice Armor Ascent! The best ice bib for you depends on a lot of factors we can’t know. If you’re a woman, for instance, we’d recommend trying the Ascent or Striker’s Ice Climate to see if it fits before turning to the Ice Prism, simply because of the features that women-specific bib lacks. And if you’re on a tight budget, and can’t afford a bib with added floatation, we’d steer you toward the otherwise excellent Frabill I3. It’s our top choice for those who need to spend as little as possible on new gear. But the best of the bunch for most ice anglers is probably the Ascent. Warm, waterproof, and tough, it’s packed with details that matter. From excellent zippers to removable insulation, quick release suspenders to awesome pockets, it offers a list of things that matter when you’re chasing crappie and pike in the winter. And for a bit of peace of mind, when combined with the matching parka, you’ll be a touch safer should you end up in the water. Whatever your choice, none of these bibs will let you down. Best Ice Fishing Lures: Our Favorite Jigs and some Tips and Tricks! Born and raised in Cleveland, Ohio, Pete grew up fishing on the Great Lakes. When he’s not out on the water, you can find him reading his favorite books, and spending time with his family. USAngler.com is a participant in the Amazon Services LLC Associates Program, an affiliate advertising program designed to provide a means for sites to earn advertising fees by advertising and linking to Amazon.com. Additionally, USAngler.com participates in various other affiliate programs, and we sometimes get a commission through purchases made through our links.